Wilfred Cleaver Hunter was born in Rugby in 1891. He was the third son of Thomas Hunter and his wife Emily Cleaver, who married in 1886. At the time of his birth the family were living at 94 Railway Terrace, Rugby and his father is listed as a Railway Wagon Builder (employer). His grandfather had founded the Thomas Hunter Wagon Works in Mill Road twenty years earlier. In the 1911 census the family was living at Elmhurst, in Hillmorton Road. Wilfred was aged 20 and described as a Filament Maker, Electric lamp maker. Second Lieut Wilfred Hunter was 25 years of age, and was the third son of Alderman Hunter. He and three of his brothers enlisted on the outbreak of war, and all four obtained commissions. He was a very bright and promising young man, and many outside the family circle will be grieved to know of his death. Second Lieut. Wilfred Hunter was educated at Rugby School, and afterwards entered commercial life as secretary to the Rugby Lamp Company, Ltd. He first enlisted as a gunner in the 4th South Midland Howitzer Brigade, and after seven months’ service entered the Royal Military Academy at Woolwich. On October 27th last year he was gazetted to the Royal Garrison Artillery, and left for France on December 10th, being killed in action 20 days later. Lieut. Hunter spent some days at Havre before going to the front, so must have met with his death very soon after his arrival at the actual scene of the war. Alderman and Mrs Hunter, of Elmhurst, Hillmorton Road, Rugby received the news of his death on New Year’s Day. Also of WILFRED the dearly loved son of THOMAS & EMILY HUNTER who was killed at Ypres Dec 29th 1915 aged 24 years. Thomas Ernest Abbott was born September Qtr 1889 in Rugby. The only surviving son of Elizabeth Ann Boor & Thomas Chapman Abbott. Married 9th June 1888 in St Matthews Church Rugby. Although originally from Woodford Northamptonshire. In 1891 they were living at 86 Lawford Street, he was a Joiner Carpenter, Thomas Ernest was 1 year old. By 1901 they had moved to 37 Stephen Street, still a Joiner Carpenter, and Thomas Ernest was now 11 years old, and at school. 1911 shows them living at 43 Oliver Street, Thomas Ernest aged 21 years of age was working as Piuse Clerk in the engineering trade. Thomas Ernest enlisted in the Army in Rugby on 3rd September 1914 age 25 years and 2 months, as a Rifleman in the 12th Bn Rifle Brigade. No S/1854. After training he was sent to France and sadly he died of his wounds, as stated on his service record by “61st Field Ambulance”, on 11th December 1915 aged 26 years and 5 months. He was most likely involved in The Battle of Loos which started on 25th September 1915 which is where the 61st Field Ambulance Corps were situated. His service life was short at just 1 year and 3 months. Thomas was awarded 3 medals;- Victory Medal, British Medal and 15 Star. Qualifying date 21st July ’15. His medals have remained in the family after being handed to his father Thomas Chapman Abbot. His only son Thomas Ernest Abbott died 1915. His posthumous award from King George V was given to his only surviving brother, William C. Abbott, to pass on to his only son, Arthur Abbott as there were no other males left in the Abbott line. Arthur passed it on to his son Frederick C. Abbott who passed it on to his son Nicholas C. Abbott. He is remembered with Honour on Y Farm Military Cemetery, Bois Grenier, In the North of France also on the Rugby Memorial Gates. John Thomas DORMAN’s birth was registered in early 1885 and he was a native of North Kilworth, Rugby. His father was William Thomas Dorman, possibly more commonly known as Thomas, who was born in about 1857 in North Kilworth; his mother was Sarah Jane née Robinson, who was born in Newark in 1856. In 1891, John Dorman was 6 and had two brothers: William Dorman, aged 3, who would become a farm boy in the village before 1901; and Joseph Henry Dorman, aged 1. Their father was an Agricultural Labourer and they lived at 6 Rugby Road, North Kilworth, just down the road from the ‘Shoulder of Mutton’ pub. In 1901, John Dorman was 16 and a farm labourer, still living in Rugby Road, North Kilworth, with his parents and siblings: Joseph Dorman, now 11; Adlaide Dorman, 8; Mary Dorman, 5; and David Dorman, 1. In 1911, now calling himself ‘Jack’ Dorman, he was 26, and living in one room at the ‘Stables, 107 Albert Street’, where he was working as a Groom, presumably for John Liddington, the baker and corn dealer at 109 Albert Street next door. John’s marriage with Mary Violet Hinks was registered in Q3, 1912, in Rugby, and they later lived at 12, King Edward Road, Rugby. She had been born in Rugby, and her father was then a ‘paver’ and they lived in Pinder’s Lane. She was baptised on 19 August 1887 at St Andrew’s, Rugby. Just over two weeks later, on 11 September, the poet, Rupert Brooke would be baptised there. It seems that John and Mary had a son, also John Dorman, whose birth was registered in Rugby in Q3, 1913. It may have been John junior whose marriage to Iris S Brooks was registered in Rugby in mid-1939. It is uncertain when John joined up but he became No.M2/099389, a ‘Driver, Mechanical Transport’ in the Army Service Corps, and he was attached to the 26th Field Ambulance, Royal Army Medical Corps. He went to France on 2 June 1915. The 26th (3rd Wessex) Field Ambulance was attached to the 25th Brigade, in the 8th Division. In 1915, the 8th Division had already been in action at the Battle of Neuve Chapelle and the Battle of Aubers. John would have arrived in France well before the next major action at Bois Grenier (a diversionary attack on 25 September 1915 coinciding with the Battle of Loos – see Rugby Remembers for that date). As a driver, John would probably have been transporting injured soldiers, typically back from the various Advanced Dressing Stations, to the General Hospitals further behind the lines. The 8th Division did not seem to have been in any major actions in later 1915, indeed activity would have probably slowed for the winter. However, routine trench duties as well as hazardous resupply work and training behind the front lines would have carried on, and even during such ‘routine duties’ many soldiers were being killed and injured. It may have been whilst collecting wounded, or on routine duties, that John was wounded and transported back to base hospital. However, there was also an outbreak of a ‘mysterious respiratory infection at Etaples during the winter of 1915-16’, possibly a pre-curser of the later ‘Spanish Flu’, and he may have been a victim of such an outbreak. Whatever the circumstances, an entry in the ‘Register of Effects’ shows that John died in Etaples in the ‘No. 7, Canadian General Hospital’ on 2 December 1915, aged 32. He was buried in Grave Reference: III. G. 20A., in the nearby Etaples Military Cemetery, which served the many transit camps and hospitals in around Etaples. The Military Cemetery is to the north of the town, on the west side of the road to Boulogne. The cemetery contains 10,771 Commonwealth burials of the First World War, the earliest dating from May 1915. Etaples is a town about 27 kilometres south of Boulogne. During the First World War, it became the principal depôt and transit camp for the British Expeditionary Force in France and also the point to which the wounded were transported. The area around Etaples was the scene of immense concentrations of Commonwealth reinforcement camps and hospitals. It was remote from attack, except from aircraft, and accessible by railway from both the northern and the southern battlefields. In 1917, 100,000 troops were camped among the sand dunes. The hospitals, which included eleven general, one stationary, four Red Cross hospitals and a convalescent depot, could deal with 22,000 wounded or sick. After John’s death, in March and April 1916, sums of £7-8-8d and £9-1-4d were paid to John’s widow and sole legatee, ‘Mary V’, and then in August 1919, a ‘War Gratuity’ of £3-0-0d. John Dorman was awarded the British War and Victory Medals and the 1915 Star. He is remembered on the Rugby Memorial Gates. It would appear that John’s widow, Mary, remarried with an Arthur Hinks in Lutterworth in mid-1920. No other record of him has been found on-line and certificates would have to be purchased to advance any knowledge of him. It will be recalled that Hinks was also Mary’s maiden name, although they do not appear to be obviously related. They had three children, half-siblings for John junior, all registered in Rugby: Joyce D M Hinks in Q2 1923; Matthew A T in Q4, 1925; and Rosemary J in Q4, 1930. This summary was prepared for the Rugby Family History Group by John P H Frearson in November 2015. Thanks are due to other members of the Group for copying data in the local newspaper. T for Thomas, not V, as recorded on the Rugby Memorial Gates. John’s father was recorded as Thomas rather than William by the Commonwealth War Graves Commission. Connor, Steve, Flu epidemic traced to Great War transit camp, The Guardian, Saturday, 8 January 2000. The handwritten entry is unclear and was transcribed as ‘No 1 Candie Genl Hospl’. This was probably the No.1 Canadian General Hospital which is listed at Etaples, at http://www.anzacday.org.au/digging/hospitals.html; and which apparently later moved to Trouville. See also: List of Canadian Hospitals Overseas – War of 1914-1918, in “Three Centuries of Canadian Nursing“, 1947, p.311. Arthur James DODD was born in about 1885 and was baptised at St. Andrew’s, Rugby, on 2 October 1885. His father was William Dodd, born about 1851 in Rugby, who had married Selina Reeve, at St. Andrew’s, Rugby on 7 November 1881. She was born at Hinton, Gloucestershire in about 1863. In 1891 William was auctioneer’s assistant living at 19 Pinders Lane, Rugby. In 1901, Arthur was the oldest child, aged 15, and working as ‘Lamp Lighter Gas’. His two younger sisters, [Alice] Elsie and Mabel, were then aged 6 and 4. William Dodd died in 1902, and in about 1905, Selina apparently ‘married’ a mechanic, George Bradley, who came from Leicestershire, although no record has been found, and they lived then at 19 Alexandra Terrace, Pinders Lane, Rugby. By 1911, they had had two children: one, probably George whose birth and death were registered in Q4, 1905; and a daughter, Norah Georgina, born 1907, who was now 3 years old. Well before the war, and apparently very soon after that 1901 census, Arthur became a soldier and joined the 1st Battalion, the Royal Warwickshire Regiment. The two ‘peace-time’ Warwickshire Battalions would alternate between the UK and an overseas posting, and in 1911 Arthur was enumerated with the 1st Battalion in ‘Ceylon and India’. He was 26 and had been promoted to Lance Corporal. The 1st Battalion sailed from India in December 1912, and arrived back to the UK in early January 1913. They were initially based at Shorncliffe, near Folkestone, with 10th Brigade, 4th Division. On 8 August 1914, amid fears of a German invasion of the East coast, the 4th Division was held back from the original British Expeditionary Force (BEF) and sent by train to Yorkshire in a last minute decision to defend England against a possible German landing. Almost immediately this fear was seen to be unfounded: the fate of the BEF in France and the lack of any move by the enemy to cross the Channel, reversed this decision and they were sent back to join the other units of the 10th Brigade, 4th Division of the BEF at Southampton. There they boarded the SS Caledonian on 22 August 1914 and landed at Boulogne in France the following day, arriving in time to provide infantry reinforcements at the Battle of Le Cateau. They were subsequently in action at the Battle of the Marne, the Battle of the Aisne and at the Battle of Messines in 1914. In 1915 they fought in the Second Battle of Ypres and later in 1916 they would move south to the Somme. Arthur did not accompany the Battalion to France in 1914, possibly being held back, as an experienced NCO, to assist with the training of the large numbers of new recruits. Certainly his Medal Card shows that before later 1915, he had been promoted: first to Sergeant and then to Company Sergeant Major, Warrant Officer Class 2, No. 9393, in the 1st Battalion. His Medal Card shows that he finally went to France on 2 May 1915. This would have been during the Second Battle of Ypres which was being fought from 22 April to 25 May 1915. In August 1915, the 1st Warwicks were sent to the Redan Ridge/Mailly Maillet sector, where they took over the French trenches. ‘Sergeant Major Dodd reported killed – Mistaken for a German Sniper. ‘On 1 December, CSM Arthur Dodd was killed coming from the trenches when a sentry mistook him for a German sniper. He came from Rugby and had been in the army for 14 years. It seems that the idea of holding the front line ‘by posts’ only because of the conditions was not just a 48th Division idea used by the Warwicks Territorials, as the 1st Battalion did the same from at least 8 December. …’. Arthur was buried in Grave Reference:III. E. 5. in the Sucrerie Military Cemetery, Colincamps – a village about 16 kilometres north of Albert. Sucrerie was originally called the ‘10th Brigade Cemetery’ and was near the front line. Indeed, in the period when Warrant Officer Dodd was killed, the great majority of casualties buried there were from the 10th Brigade: from the 1st Bn. Warwickshires and the 2nd Bn. Seaforth Highlanders, as well as the 1st Bn. Royal Irish Rifles. Between August 1915 and the end of the year, 22 men from the Royal Warwickshire Regiment were buried at Sucrerie. The cemetery was begun by French troops in the early summer of 1915, and extended to the west by British units from July in that year until December 1918. Until the German retreat in March 1917, it was never more than a 1.6 kilometres from the front line. The cemetery was designed by Sir Reginald Blomfield. His family inserted an ‘In Memoriam’ notice in the Rugby Advertiser. ‘Dodd – In loving remembrance of my dear son, Company Sergt.-Major Dodd, who was killed in France, December 2, 1915. He was awarded the British War and Victory Medals and the 1915 Star. He is remembered on the Rugby Memorial Gates. This may have been because any ‘pension’ may have been lost if she re-married; or merely that the record of the marriage has not been correctly recorded. He was said to have served for 14 years when he was Killed in Action in December 1915. It seems that there is a discrepancy between the date given to the family and that used by the CWGC. John Alfred HOUSE was born in late 1879 in Marton, Warwickshire, not far from Rugby. His birth was registered in Q4, 1879 in Rugby. His father, William, was from Brownsover and was variously a house painter and glazier; his mother, Emma was from Marton. On census night 1901, John was a 21 year old, ‘general labourer’, boarding at 25 Stanley Street, Garston, Lancashire, with the Fiddler family. Later that year he would marry the daughter of the house, Mary Ann Fiddler, in Rugby. In 1911, he was 31 years old and living with his wife, Mary Ann and their family at 13 Plowman Street, Rugby. By then they had three children: Harry House, aged 8, who died aged 10, two years later in 1913; Frank House, aged 4 and John House, aged 2. They would have three more children: a daughter, Gladys M, was registered in Q3, 1911; a boy in Q2, 1913 but he died, unnamed, at or soon after birth; and a daughter, Winifred M, who was registered in Q4, 1914. In 1911 John had been working as a fishmonger, however, assuming this is the correct John House, by the start of the war he had moved to very different employment in the Machine Shop at BTH. He probably joined up early in the war, despite being in his mid-30s. He became a Rifleman, No.R/209, in ‘A’ Company, 11th (Service) Battalion, of the Kings Royal Rifle Corps. This was probably in early September 1914, as the service records of another Rifleman, James Stanley, with a similarly low service number, R/354, who also joined the 11th, was attested on 8 September 1914. The 11th (Service) Battalion, King’s Royal Rifle Corps (KRRC) was raised at Winchester in September 1914 as part of Kitchener’s Second New Army, and joined 59th Brigade, 20th (Light) Division. After training close to home they moved to Blackdown, then in February 1915 to Witley and to Larkhill, near Stonehenge, on Salisbury Plain in April for final training. At some date John was promoted to Lance-Corporal. The Division was inspected by King George V at Knighton Down on 24 June 1915, by which time all their equipment had arrived and the Division was judged ready for war. They proceeded to France on 21 July 1915, landing at Boulogne, and by 26 July 1915 the Division completed concentration in the Saint-Omer area. Early trench familiarisation and training took place in the Fleurbaix area. John House’s Medal Card confirms that he was with his Battalion when they went to France on 21 July 1915. The Division did not seem to have been in any major actions in late 1915, indeed activity had probably slowed for the winter. However, routine trench duties as well as hazardous resupply work and training behind the front lines would have carried on. It was probably during such fairly ‘routine duties’ that John House was ‘killed in action’ on 10 November 1915. He was buried in Grave Reference: A.10. in the Rue-du-Bacquerot (13th London) Graveyard, Laventie, France. Although some way behind the front line, it seems this graveyard was used by the 20th Division for casualties during October and November 1915. Of the 17 casualties buried at Laventie in the two months between 1 October and 30 November 1915, fifteen were from the 20th Division: four from the 11th KRRC in 59th Brigade, and five from the 7th Somersets and six from the 12th King’s Liverpools, both in 61st Brigade. Laventie is some 6 kilometers south-west of Armentieres and 11 kilometers north of La Bassee. The ‘13th London’ Graveyard was begun by the 1st Royal Irish Rifles in November 1914, and during and after the following December graves of the 13th London Regiment (The Kensingtons) were added. The cemetery was closed in July 1916. It was known also as the Red House Cemetery from a ruined house, now rebuilt, on the South side of the road. There are 192 Commonwealth burials of the 1914-18 war commemorated in this site, unusually only one is unidentified, which suggests that the graveyard was used in comparatively quieter periods, when casualties could be more readily identified. John was awarded the Victory and British Medals and the 1915 Star. 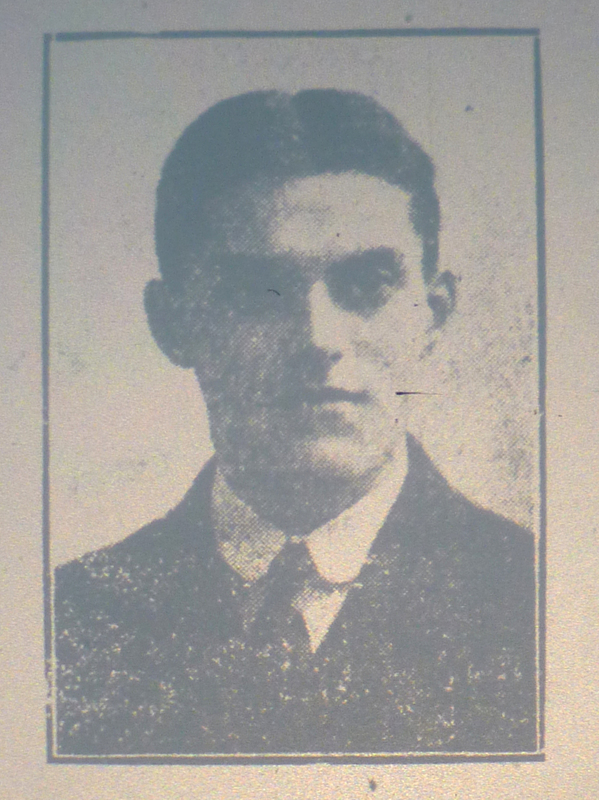 He is remembered on the Rugby Memorial Gate and on the BTH list of Employees who served in the War, but was omitted from the BTH list of those who ‘Fell in the War’, although he is on the BTH War Memorial, and was included on the listing that was published in the Rugby Advertiser on 4 November 1921, when the memorial was unveiled. It appears that his widow Mary Ann House died in Rugby, aged 50 in late 1929.
 http://www.wartimememoriesproject.com/greatwar/allied/battalion.php?pid=6484#sthash.kufyfTjP.dpuf; also The Long Long Trail, at http://www.1914-1918.net/20div.htm. Commonwealth War Graves Commission, http://www.cwgc.org/.